Passengers are to be hit by above-inflation rate fare increases. Season tickets and saver and standard day returns will rise by 4.8% on average, says the Association of Train Operating Companies (Atoc). Others, such as cheap day returns and long-distance open and advance fares will go up by 5.4%. The increases will come into effect in the New Year. 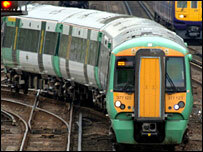 The Transport Salaried Staffs' Association said commuters travelling to London would be worst hit. A weekly season ticket from Hayes in Kent to London will rise by 14.5% from £24.80 to £28.50. A similar ticket from Bexleyheath into the capital will go up from £25.10 to £28.50 or 13%, and for commuters in Ashford, Kent, a London-bound journey will rise by 10.5% from £78.30 to £86.50 a week. George Muir, Atoc director general, said: "We need the revenue from fares to pay for investment in the railway for the benefit of passengers. "We are providing a higher-performing railway with new, refurbished and more punctual trains and better stations." He said nearly 91% of trains ran on time between April and September this year, the highest punctuality level for a decade. But unions and passenger groups have criticised the size of the rises. Anthony Smith, chief executive of Passenger Focus, an independent rail watchdog, said: "Passengers will be dismayed that fares are going up again, especially as on most routes they have no choice about which train company to use. "Many commuters will have to fork out hundreds of extra pounds for their next annual season ticket." He said as passengers braced themselves for more rises between now and 2014, they would be expecting a better service. Transport Salaried Staffs' Association general secretary Gerry Doherty described the rises as "outrageous". "Rail companies are holding passengers to ransom every year and the government are allowing them to get away with it," he said. He called for a not-for-profit railway instead of the expensive privately-run current system. Bob Crow, general secretary of the Rail Maritime and Transport union (RMT), said: "The private franchises are interested only in lining their shareholders' pockets, yet the failure to impose a sensible fares policy is having a direct effect on the environment, as more and more people who should be on trains take to their cars." Shadow transport secretary Theresa Villiers said: "Labour's fingerprints are all over these fare rises. "We have now had years of escalating above-inflation increases which are hitting many family budgets hard." She blamed the government's "mismanagement of the rail network and its failure to deal with the dire shortage of capacity" for leaving ministers with no other option but fare hikes to tackle overcrowding. In a statement, Atoc said the "small increase" in average rail fares partly reflects the fact that more than half of tickets sold are price-regulated by the government. It added that many passengers are choosing to use discounted fares such as advance tickets, rather than pay for full-price tickets. "The relatively low increase in average rail fares has been a factor in the enormous growth in rail travel seen over the past 10 years, with 42% more passengers using the rail network," it said. Atoc's statement added that the extra revenue would pay for railway improvements, with more than £800m being spent on new and refurbished trains.